Having failed to see any badgers in the evening, I decided to take another approach. I was confident that the badgers feed in a large pasture field next to the wood, and it’s always been at the back of my mind to take a trip up there one night and see if I can spot them feeding. It being a damp and mild night with ideal conditions for the worms the badgers feed on, I decided to give it a go. 1.45am (way past my bedtime!) saw me walking slowly through the pasture with a dim torch. And there, snuffling around in the grass, was one of the adult badgers! It didn’t seem too bothered by the torchlight, but carried on snuffling contentedly. I watched it for about five minutes and then left it to get on with its dinner. I was happy to have seen a badger in its own element, and proved that this method of watching them was possible. I may well stay up late on the next full moon and try this again. Finally, an answer to those readers who think there should be more hedgehogs on this site (you know who you are!). Folk wisdom says that where there are badgers there are not usually many hedgehogs, presumably because one eats the other. I don’t know if that’s true, but I haven’t seen many hedgehogs around here. So, especially for you, here’s a picture of an urchin that was feeding contentedly on the village green when I walked past. By the time I’d gone home and got the camera he was sitting in the middle of the road, which says a lot about hedgehogs. I did try and pick him up and move him off the road, but I found out that the spines on a hedgehog are not just there for show – they really are sharp and spiky! This may sound obvious, but I’d never tried to pick up a hedgehog before. 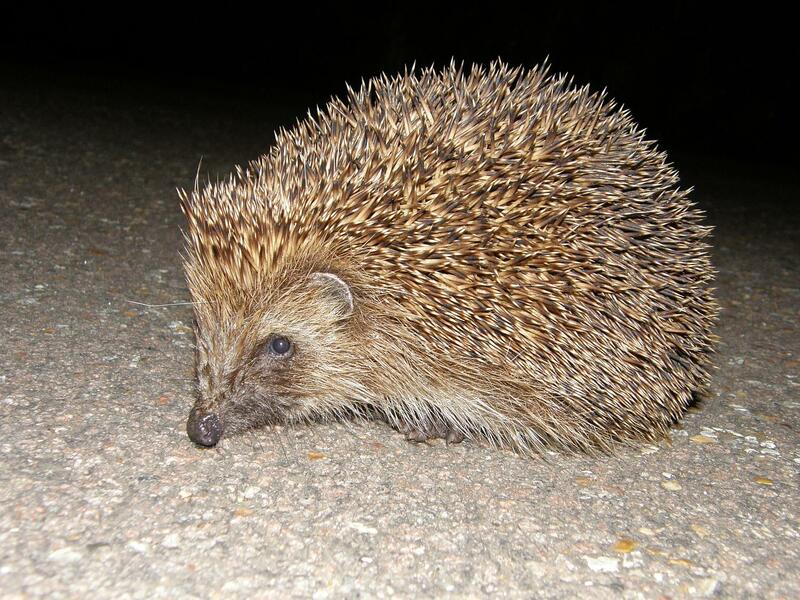 I did manage to move him to the side of the road, and left him there out of harm’s way, spiny and verminous, but safe. Verminous – careful you don’t tell the hedgehog that you have described him thusly, he might poke you! Thanks – it is quite a good photo. Hedgehogs are much easier to photograph than badgers because you can walk right up to them and they move obligingly slowly. I may splash out some of my file space and upload a bigger image. And I sure he wouldn’t mind being called that. Hedgehogs are famous for having a multitude of fleas under their spines. Actually, it’s almost a quote from a favourite book of mine, The Book Of Merlyn, by T.H. White, in which the hedgehog describes himself as ‘verminous, but loyal’. I’ve always liked the word. Well Hello Hedgehog! What a wonderful photo, and such a beauty. Delighted that they now share limelight along with the badgers. Don’t see so many road casualties now. Wonder if it’s because they are on the decline, or have developed road sense. Enjoy this blog immensely! Glad you liked it – it was especially for you! This particular hedgehog didn’t have much road sense, but then it was 2.30am on a quiet country road so I’m sure he knew what he was doing. Come to think of it, I was lying in the road taking photographs, so the same can be said of me! Wow – I didn’t know that Badgers could be so noisy! Wow – nice one. They must be very romantic, those German badgers. I think the British ones must have a stiff upper lip by comparison!